Decorating for Christmas and saving money doesn't always go hand in hand. 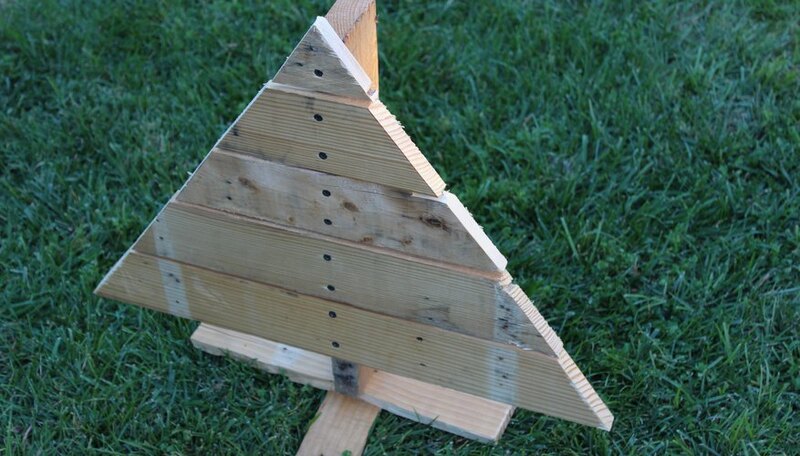 This holiday season, skip the expensive store-bought decor and turn an old pallet into a Christmas tree instead. Festive for indoor or outdoor display, this DIY is wallet-friendly and doesn't take much time. Start by wedging a crowbar between two pieces of wood and hammering it deeper. Once deep enough, start to pull the wood pieces apart with the crowbar. 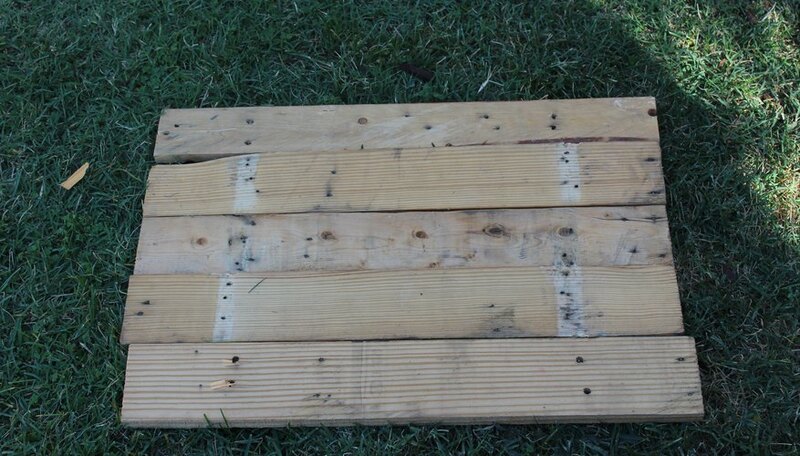 Continue doing this with each piece of wood until the whole pallet has been disassembled. 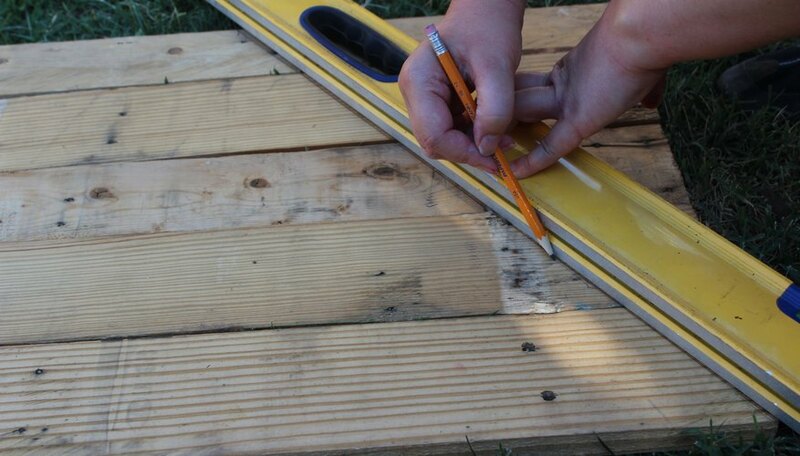 Lay out five wooden slats horizontally, making sure they all touch and are even on each side. Draw a line starting from the middle of the top slat and continue down to the bottom right corner of the bottom slat. Use a straight edge or measuring tape to help keep the line straight. Mirror this effect on the other side. 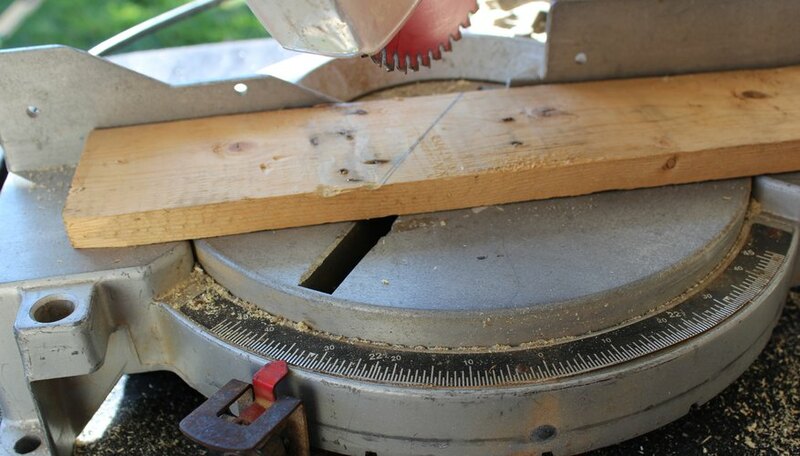 Use the chop saw to cut each wooden slat. Since you are cutting angled pieces, you will need to change the angle of the saw according to the angle you have drawn your line (about 37 degrees in this project). 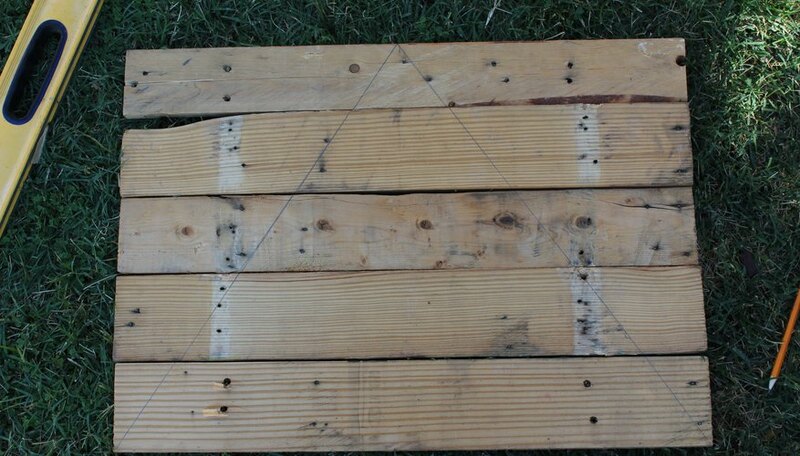 Since each pallet will vary, double check which angle to use when lining up the blade to the wood. Cut the reserved slat piece in half. Place one half perpendicularly over the other, creating a cross. Now place the reserved two-by-four piece vertically on top of the crossed pieces, which will act as the spine of the tree. Flip all three pieces upside down and pre-drill a hole going through the cross into the spine. 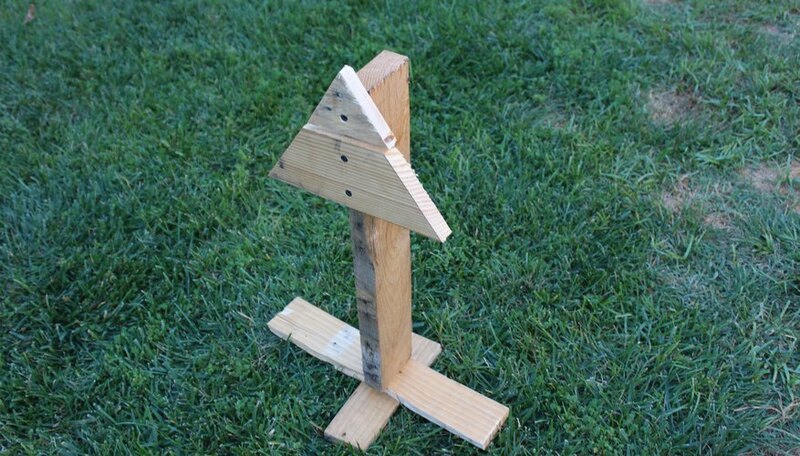 Now drill a 2 1/2-inch screw into all three pieces to secure your tree stand. Center the top piece of your tree at the top of the spine of the tree. Pre-drill a hole in the middle of it and then drill a 1 1/4-inch screw through the top piece into the spine to hold it in place. 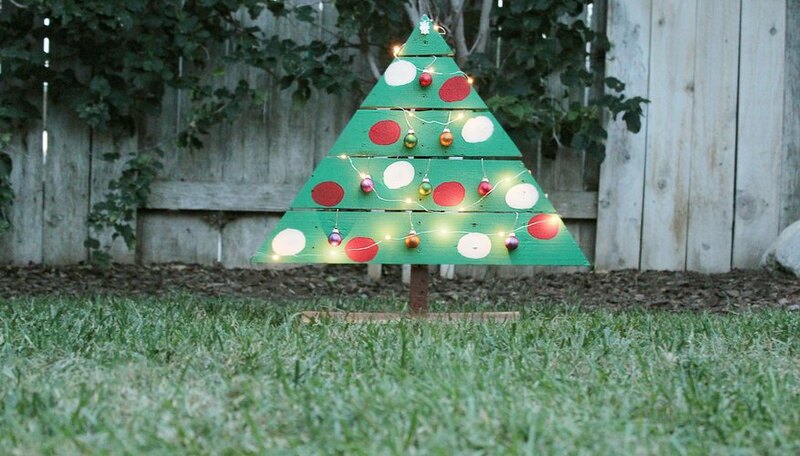 Leave a 1/4-inch space between this piece and your next tree piece. Center the next piece and secure it with two screws down the middle. Repeat this for the rest of the tree pieces. 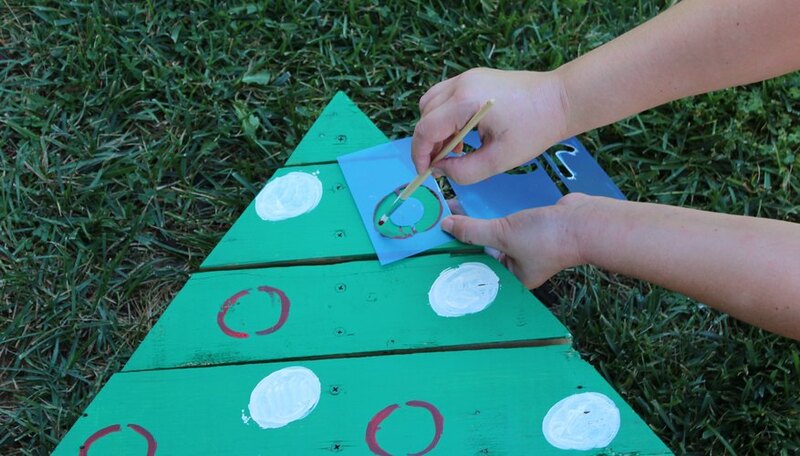 Paint the entire tree green. Once dry, you can paint on ornaments using any variety of colors or shapes that go with your Christmas theme -- dealer's choice here. Use a round stencil to help create ball ornaments. Finish by painting the tree trunk brown to resemble bark. Weaving LED lights through the openings between the slats turns the tree into an impressive display both day and night. 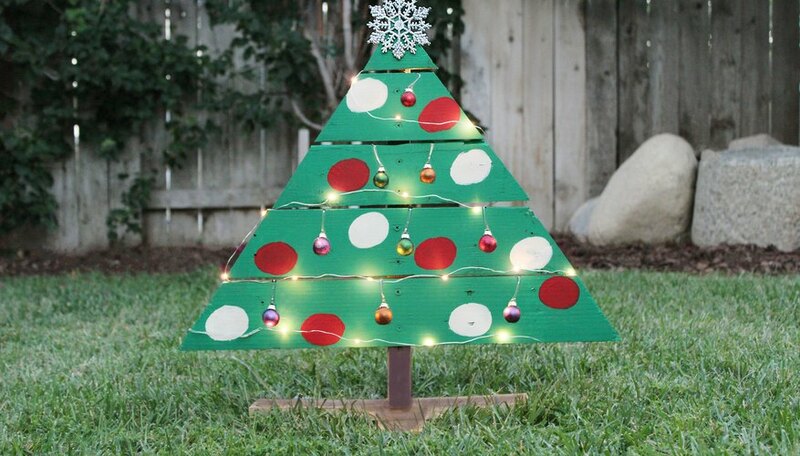 Since you have some space between each slat, you can also hang real ornaments to give it a more festive look. Garnish with a star or your tree topper of choice.